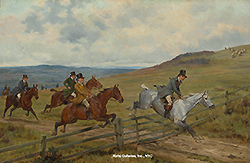 George Goodwin Kilburne was born on July 24, 1839 in Norfolk and received his artistic training under the Dalziel brothers – a family of engravers and illustrators with whom he worked and studied with for 5 years. 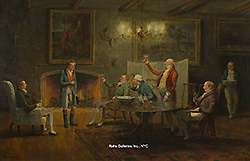 Kilburne’s early training was in the art of engraving, but he quickly turned his attention to both oil and watercolor painting. 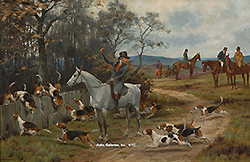 He specialized in beautifully detailed hunting scenes and costume painting and many of his works were made into prints. 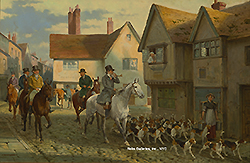 Kilburne became an associate at the Royal Institute of Painters in Watercolor (RI) in 1866 and a full member in 1868. He was elected a member of the Royal Institute of Oil Painters (ROI) in 1883 and a member of the Royal Miniature Society in 1898. 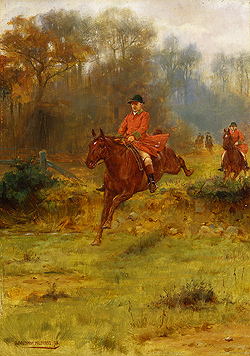 Throughout his lifetime he exhibited at all the major exhibition halls in England – these included the Royal Academy (showing 37 works); Walker Art Gallery, Liverpool (showing 28 works); Royal Institute of Oil Painters (showing 52 works) and the Royal Society of Artists, Birmingham (showing 18 works). Kilburne married the niece of one of the Dalziel brothers and had a child – George G. Kilburne, Jr., who would follow in his father’s footsteps.